Blurb: Infusing modern EDM touches with the trademarks of the band’s sound, this latest endeavor demonstrates a renewed vitality that makes for one of Front Line Assembly’s best releases. As one of the most prolific and revered entities in industrial/electronic music, Front Line Assembly has shown no signs of slowing down. Though the band’s trademarks of deep synths and mechanized beats evoking dystopian atmospheres perfect for a futuristic cyberpunk soundtrack have remained, recent outings like 2010’s Improvised Electronic Device and the AirMech video game soundtrack have demonstrated Bill Leeb and co.’s willingness to continue experimenting and take the sound of FLA into newer territories with mixed results. However, with Echogenetic, there is a sense of renewed vitality that makes for perhaps the most energetic and bombastic Front Line Assembly album in years. 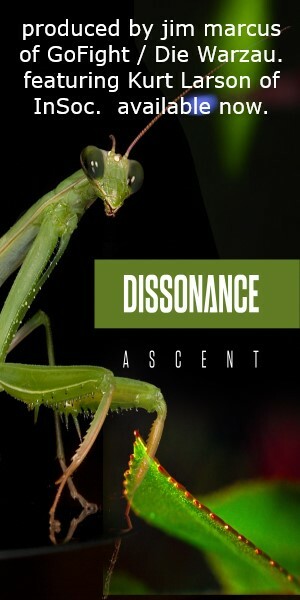 Throughout Echogenetic are the familiar tropes of the FLA sound – deeply resonant synths that provide ominous yet catchy bass lines, intricately programmed beats that mutate as each song progresses to provide a mechanized yet organic atmosphere, and Leeb’s guttural vocal style, freely floating between melodic minimalism and robotic fury. Perhaps the best example of this is “Blood,” the verses pulsating with a scathing and raspy industrial rage before kicking into a highly infectious yet deceptively simple chorus that may prove to be one of the band’s best songs. Where the album really shines in its modernistic touches is the skillful and seamless inclusion of dubstep and other EDM elements, particularly in a song like “Killing Grounds” as the juxtaposition of a familiarly pumping bass and beat meshes with staccato arrangements and warbling textures, making the song perfect for the dance floor. Other tracks like “Deadened” and “Exhale” move in similar fashion with their washes of slithery and gritty synths amid stomping beats while still injecting suitably cold, distorted, and above all catchy melodies in the choruses. Even in the album’s slower moments like the appropriately titled “Ghosts” with its haunting cadence and celestial vocoder laced chorus, the chilling dubstep march of the title track, or the mechanically menacing instrumental crawl of “Prototype” sounding like the awakening of a titanic automaton hell bent on mass destruction are exemplary of some of the most inspired material the band has ever produced. Aided by Jeremy Inkel, Jared Slingerland, and newcomers Craig Johnsen and Sasha Keevill, it would be easy to surmise that Leeb is simply riding on the creative energy provided by his younger collaborators. 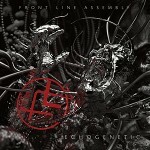 This is hardly a source for complaint given the ambitious and exploratory nature of Echogenetic, once again combining the most recognizable aspects of the Front Line Assembly sound with a modern edge to keep the album sounding fresh and exciting; no small feat for a band with nearly three decades of history behind it. 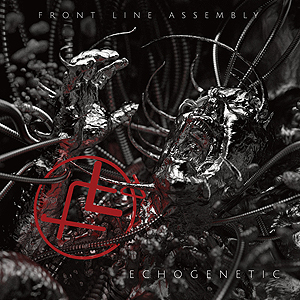 Even with the absence of guitars, the music is filled with all the vigor and viciousness of a rocking industrial tour-de-force, proving that with Echogenetic, Front Line Assembly is once again at the top of its game.